Take a look at the chart below. The black line is the price of gold... The gray line shows increases in the Consumer Price Index (CPI). It's the government's measure of inflation. And no, it's not perfect. But it does show that prices increased from 1987 to 2004. 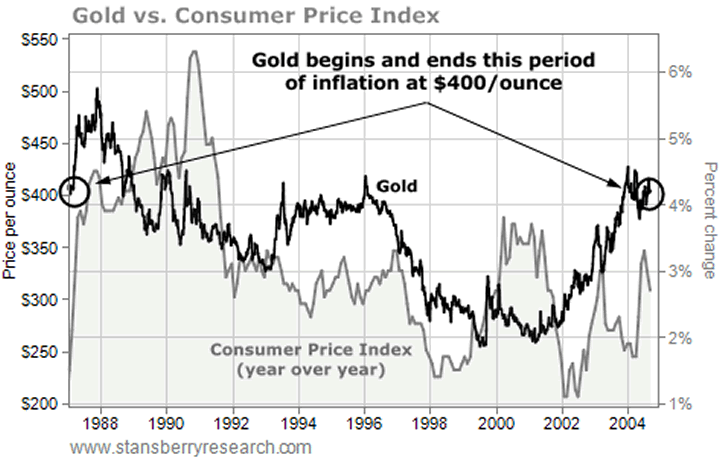 You can see that during 17 years of inflation, as consumer prices were increasing, gold prices went nowhere. For example, when inflation has been more than interest rates on U.S. Treasurys, gold has been a great asset to own. But that situation is uncommon. It has only happened about 16% of the time. Most of the time, when the five-year Treasury note has paid more than inflation, gold has done nothing. So a much better way to secure your retirement against inflation is to regularly invest in "productive assets." These include everything from farms to businesses. These assets have the power to protect against inflation because they can grow your investment faster than inflation erodes it. Look for businesses (stocks) that hold pricing power and have brand loyalty. If inflation kicks in, the ability to raise prices right along with input costs helps maintain your wealth. And businesses with loyal customers can usually pass along those price hikes without much loss in volume. That means steady profit margins and more wealth. Take a company like McDonald's (MCD). The demand for fast food will continue, and Mickey D's will surely still be slinging burgers in another five or 10 years. The company regularly responds to consumer demand. For example, it placated health-conscious parents by offering apples and milk in its Happy Meals. And it sells lattes to compete with local coffeehouses. Some retired friends of mine just confessed to a daily trip to "their coffee shop" – the one under the Golden Arches. If prices go up along with inflation, you can be sure McDonald's will retain its loyal patrons and its profits like it has for the last 50 years. Companies like McDonald's are perfect inflation defenses. 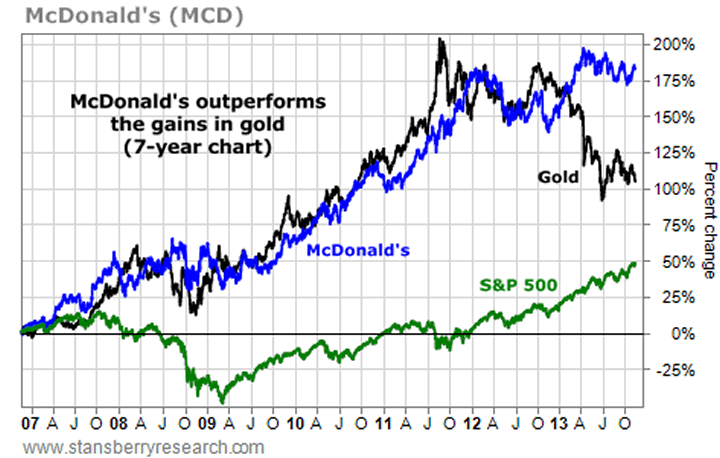 This chart of McDonald's, gold, and the S&P 500 shows how a great, blue-chip company protects you as well as – or better than – gold can during tough times. Here's another way to look at it... A while ago, a Fortune magazine article compared three $100 investments placed in six-month U.S. Treasury bills (short-term interest-bearing securities), gold, and the S&P 500 in 1965. Today, those investments would be worth $1,336, $4,455, and $6,072, respectively. Stocks beat gold by 36%. This shows the power of long-term investing in good stocks. As my regular readers know, I like gold and silver as "chaos hedges." During times of great economic and political stress, gold outperforms many asset classes. But I don't recommend putting more than 15% of your portfolio here (and I prefer an allocation closer to 5%). If you're truly interested in an "all weather" asset to place a large chunk of your portfolio into, go with the world's best dividend-paying companies... like Coca-Cola, McDonald's, and Johnson & Johnson. If inflation ever gets to be a problem, you can depend on these companies to grow your nest egg, while paying cash dividends along the way. If inflation isn't a problem (like right now), these companies still grow your wealth and pay ever-rising cash dividends. No one can make those claims for gold. Crux note: Doc spent the last 18 months developing several strategies to "time" his investments in blue-chip stocks and other great income-producing assets. What he developed is extraordinary... A legitimate way to make up to 10-20 times more money than others, on the exact same income investments. Even better, Doc has created an easy way to help you use these strategies, starting this month. You can get all the details by clicking here. Please note, this opportunity closes TONIGHT at midnight.